Due to poorly managed provider directories, a significant percentage of clinicians who are listed on a health plan’s website may not be operating at a given facility, accepting new patients, accepting certain insurance plans, or even actively practicing. The Center for Medicare and Medicaid Services (CMS) has taken matters into their own hands with a series of regulations and reforms aimed to improve consumers’ experiences and protect them from out-of-network charges. These looming requirements around the creation and upkeep of accurate, up-to-date provider directories offer an opportunity for technology companies – though not without a fair set of challenges for vendors as well as health plans themselves. athenahealth Acquires RazorInsights: Can athenahealth Succeed Where Others Have Failed? On Wednesday, January 14, athenahealth announced it will acquire the cloud-based EHR & RCM company, RazorInsights. RazorInsights’ target market is rural, critical access, and community hospitals (25-50 beds), which aligns well with athenahealth’s strategy to move upstream into the inpatient market. As a part of the acquisition, athenahealth gains ~25 hospital clients currently running RazorInsights’ ONE EHR solution. athenahealth did not disclose any transaction details although early estimates are for a $40 to $50 million purchase price. Even though athenahealth is already working on developing additional services for the inpatient market, the RazorInsights acquisition represents an effort to fast forward this process. The acquisition opens up a new segment of the market, albeit one that has modest growth prospects that are far below athenahealth’s targeted 30% bookings growth goal. This market also has some well-entrenched competitors e.g., CPSI and Meditech, and others targeting this sector – Cerner with its own cloud-based solution, CommunityWorks. If athenahealth/RazorInsights is successful though in continuing to add additional small hospital clients at a steady clip and additional sales of their population health and care coordination solution (athenaCoordinator), it will present a compelling blueprint for other ambulatory EHR vendors and validates some of Jonathan Bush’s broader vision of what athenahealth represents. Healthcare organizations (HCO) are slowly beginning to approach patient engagement with a strategic outlook that goes beyond the tactical Meaningful Use checklist. As they transition towards engagement that is broader, deeper, and ultimately more valuable, early adopters in the delivery system are realizing that success requires ongoing efforts beyond the one-time setup of a patient portal. Responding to (and in most cases encouraging) this trend, patient engagement vendors have rolled out a menu of ancillary tools and additional services that go beyond standard IT implementation and support. With patient engagement presenting a unique set of challenges distinct from other health reform efforts, Chilmark sees the market developing a demand for such services and enhanced features over the coming years. Last summer we published another edition of our popular Health Information Exchange (HIE) Market Trends Report. Over the years, this report has for many, become the “authoritative source of information on the HIE Market.” That’s not me talking, that is exactly what we have heard from those who have purchased this report. Provide research that will assist Healthcare Organizations (HCOs) in their understanding, assessment, adoption, deployment and use of IT to improve the quality of care delivered. This is what get us up in the morning. This is what motivates us for everyone here at Chilmark wants to make a contribution to improving this crazy, at times frustrating, market sector. With the release of the latest 2013 HIE Market Trends Report, however, I had an uneasy feeling. The vast majority of the market continued to view HIE as just that, moving basic health information from point A to point B. If anything, HIE has been further dumbed-down with the advent of Direct Secure Messaging, which is really nothing more than secure, point-to-point email – a far cry from interoperability and query-based information exchange. Another issue was that I was not seeing much thought going into what is next for HCOs and their investments in HIE. Recent reports such as HIEs reduce ED visits is something we have been talking about for years. Seriously, is this the best we can come up with? What new capabilities will HCOs want (or be able) to enable across their HIE? What is the next level of value realization beyond basic records exchange and lab orders/referrals? I increasingly came to the realization that the vocabulary of how we talk about HIE needed to change. Language is powerful and our current fixation on HIE and the vocabulary associated with it may be preventing this industry from looking beyond this limited construct. For the purposes of that 2013 HIE report, we used the term HIE 2.0 (did I ever mention I have never been a fan of 2.0 attached to any acronym) to signal a change. In late fall of 2013, after some discussions with clients, consultants and HCO executives, we decided there was the need to test these ruminations. Chilmark put together a prospectus for a research project on Clinician Network Management (CNM) and found five willing sponsors for this research (CareEvolution, McKesson, Optum, Orion Health and one that prefers to remain anonymous). The research objective was to conduct primary research to determine the state of the market in moving to enable CNM, which goes under many guises including physician alignment, clinically integrated networks, etc. but none of these terms have quite the scope that we envisioned for CNM. Some of the results of our CNM research are quite telling. The market is roiling under massive structural changes. Most HCOs are ill-prepared for the move to from fee-for-service to value-based reimbursement (VBR), though all see it coming. Those select HCOs who are now preparing for VBR are looking to be quite prescriptive in their requirements of affiliated and owned physicians – that will be supported via a CNM model. There remains a divide (level of distrust) between payers and providers that will take time to mend despite the need for both to work more closely together. HIT vendors are, by and large, not keeping up with the needs of HCOs to support CNM initiatives. A best-of-breed approach is seen as only path forward today to enable CNM. Of course, we learned far more than the above which you’ll find in the report itself. Since this report was sponsored with the intent of helping to educate the market, it is being offered for free. I encourage you to grab a copy – you won’t be disappointed. As Healthcare organizations (HCOs) begin to go “beyond the portal” with their approaches to patient engagement, they are broadening the strategy around measuring interactions and engagements with patients and consumers. Historically, these measures have mostly been limited to formalized, survey-driven frameworks for patient satisfaction. More recently, the Meaningful Use program put into place the first real impetus for IT-driven measurement of patient engagement with a handful of basic measures. Moving into tomorrow, a new crop of risk-bearing, “self-aware” delivery systems has started to dig deeper into tracking patient and provider activity in real-time so as to improve effectiveness and efficiency of clinical and business operations. This burgeoning shift, led in no small part by the new crop of vendors dedicated to patient engagement, has several short and mid-term implications for the HIT market. HIMSS14…. brought me to the highest of highs and the lowest of lows. As in HIMSS past, I found myself surrounded by people genuinely committed to fixing our defunct healthcare system — and the population health management group-chant was louder than ever. At the same time, I died a little inside as I witnessed healthcare execs smoking, eating gluttonous amounts of salt-sugar-fat, and struggling to walk long distances in heels that would give podiatrists nightmares. Is pop health mgmt. the solution to all of our human failings? Probably not, but more IT might just keep some diabetics compliant, risk better managed, and doctors more aware of care delivery variation. A common analytics/pop health tech stack is emerging. The larger HIT vendors are now offering more comprehensive pop health solutions, as detailed in my CAPH Tech Stack diagram. 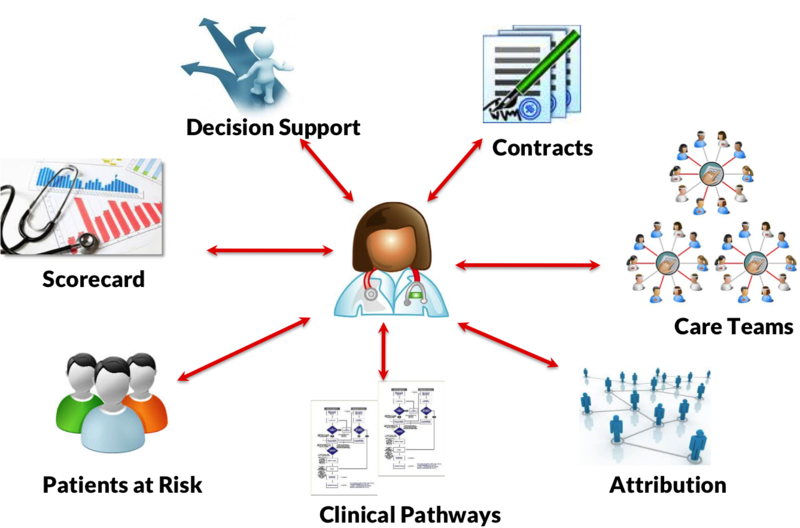 These consist of (1) A data integration piece (2) Performance Management Analytics (3) Care Management Workflow apps. Lots of small vendors are implementing pieces of this stack, e.g. they specialize in data integration, quality measures, predictive analytics, care management, … On everyone’s mind is how the best-of-breed approach vs. single vendor solution will shake out in the long run. Vendors that are missing a piece of the puzzle want to fill this gap quickly, e.g. analytics-heavy vendors want to offer care management apps on top; care management vendors are looking for a strong analytics partner. Data integration is hard to do and even more difficult to explain to the market. I continue to talk to anyone who cares about how challenging clinical data integration is at this point in time. Analytics vendors are in a precarious position where both the data sources underneath them and the business rules on top are ever-changing. However, I noticed that vendors have all but given up on marketing their data integration capabilities (of course there are a few exceptions, e.g. Health Catalyst, Forward Health Group), with a few still saying that they “take care of the plumbing”. Most vendors, however, are positioning their offerings and messaging in terms of app-level capabilities, e.g. care management and physician benchmarking and seemingly ignoring data integration, or at least not talking about it. Risk-management still means very different things across payer & provider lines. Prospective, claims-based risk scoring/risk adjustment systems have been employed by payers for many years. When I asked physician leaders and clinical-centric vendors about risk, they tended to discuss LACE for readmissions, or ways of figuring out who will be high risk in the future based on clinical variables and patient-reported outcomes. (I especially heard about the following 3 variables as being crucially important: living alone, chronic condition co-morbid with depression, and zip code). (Editor’s note: And a fourth, education level). These clinical-centric folks generally knew little about and distrusted claims-based risk models — disregarding them as only prospective-based and lacking crucial variables. Combining clinical + claims data: as fuzzy as ever. I liked to ask vendors how they are combining clinical and claims into the longitudinal patient record. What is the source of truth? For example, is a diabetic defined by the ICD-9 code from adjudicated claims, or meds/labs/problem list from clinical data? What if there is a discrepancy? There are only a few options here: (1) claims data is source of truth, enrich this with clinical outcomes data; (2) clinical data is source of truth, possibly use claims to verify quality of clinical data; (3) keep clinical and claims separate, maybe feed clinical data into claims-based risk models; (4) Maintain duplicate data and do whatever the heck the client wants. Well, I heard (4) over and over again. This claims-clinical issue is a good example of just how heterogeneous and to a certain extent immature, end-user needs are at this point in time, leading vendors to build highly customizable systems that require services-intensive engagements. A few dissenters are coming out against care management workflow tools. Caradigm has just laboriously built a care management workflow tool with Geisinger Health Plan. 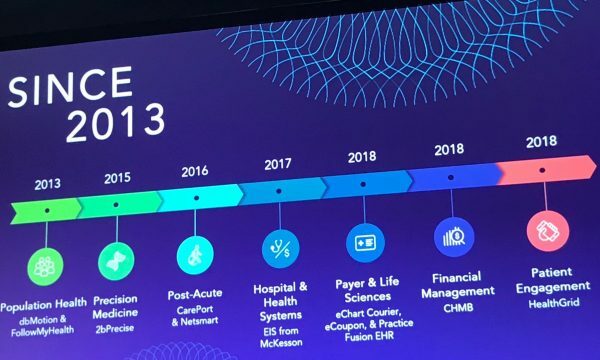 Other vendors (Optum, McKesson) have been offering payer-based care management workflow tools for a long time and are repositioning and rebuilding these for the provider market. The thinking goes that by standardizing care management into a series of steps against a common care plan, there will be less variation and fewer FTEs will be required. Smaller vendors without the $$$ or inclination to build out humongous workflow tools are asserting that these tools are already obsolete and still require too many FTEs (e.g. Phytel, Explorys). One common idea is that if we get good enough at predicting risk and automating patient outreach, then workflow tools will no longer be needed. I don’t envision care management workflow to be shelved anytime soon but am definitely not ruling out the anti-workflow camp long-term. Ladies & men alike hated walking in their shoes. Wow, I wasn’t prepared for how many people had read my barefoot post — who then proceeded to complain about how much their feet were killing them (ladies especially felt they had no choice but to wear high heels). Next year, I hope to see others join me in wearing a barefoot-like shoe so we can discuss pop health without the distraction of foot pain.